Welding robots help on specific applications which are difficult to implement using manual welding processes. On top of this, robot welding is safe because welders do not have to remain in the vicinity. 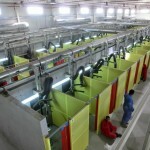 However, welding fumes which are hazardous to health are still created, and these have to be extracted. 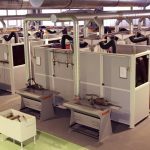 Automated welding robots relieve humans: for example, if you are welding heavy components quickly and at high piece rates. From a health point of view it is an advantage if the welder does not have to stand directly at the source of the welding fumes. This minimizes the health risks caused by hazardous substances which are given off. However, extraction still has to be carried out because the welding fumes would otherwise spread themselves through the working area. A sensible solution, which is frequently used at robot welding workplaces, is a permanently installed extraction hood or a traversable hood carried on a robot portal. 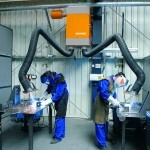 The hood is then positioned over the welding workstation. The welding fumes rise and are then collected. Side-mounted strip curtains increase the level of smoke collection by preventing airflows carrying the polluted air into the room. Extraction hoods which have an intelligent airflow principle are recommended. This means that only a very low underpressure of just a few 100 Pa in flow volumes is necessary to collect the entire thermal stream. This type of extraction hood is not suitable for manual welding work. The pollution in the breathing zone is hardly reduced at all. In this case, spot extraction systems are necessary.